About a week ago, Beth and I drove out to Southern Maryland to pick June up from Girl Scout sleepaway camp, where she’d been making calzones and mac-and-cheese in an outdoor cooking-themed program. Of course, she also swam in the pool, kayaked in the pond, did archery, and spray-dyed a t-shirt. (It’s like tie-dying but with no knots and a spray bottle of dye.) She also learned a lot of songs and ghost stories we’ve been hearing since she got back. 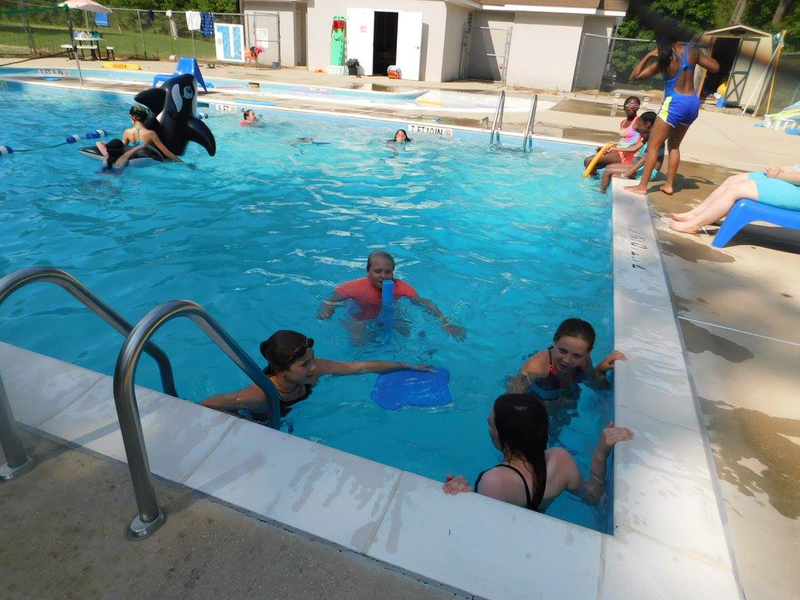 One of the most exciting things that happened to June at Camp Winona was that after two years of being put in the lowest swimming group and confined to the shallow end of the pool, she was placed in the highest of the three groups and allowed in the deep end. She’d been plotting about this for years. She tried taking swimming lessons in the spring of fourth grade in hopes of getting in a better group, but to no avail. This year she decided she was going to swim breast stroke during the test because she had a theory it impressed the camp staff when anyone did this and they automatically put them in a higher group. The only flaw in the plan was that she doesn’t know how to do the breast stroke. But when I saw a picture of her in the daily photos the camp releases playing with a pool noodle right next to the tile on the pool wall that said “7 feet, 10 inches,” I thought her plan might have worked. It turns out breast stroke wasn’t an option this year, so we’re not sure what happened, but we were happy because it was important to her and, as always, I admire her persistence and strategic thinking. June had a day to relax before it was time for her next camp. Choir camp orientation was Sunday afternoon. In addition to a couple of information sessions, the campers had their first practice and parents were invited to observe, so I tagged along. The choir director had them do some posture and breathing exercises and then some vocal warmups before he introduced them to their five songs. Three of the songs had a water theme: “Bring Me Little Water, Sylvie,” “The Quiet Sea,” and “We Know the Way,” from Moana. This song is partly in English and partly in Samoan. 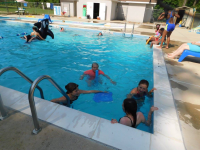 They also sang a sixteenth-century French song, “Je Ne Fus Jamais Si Aise” and “In My Life.” When the director asked how many people had heard of the Beatles song, only about half the kids’ hands went up and June’s was not among them. I’ve noticed over the years that band, orchestra, and choir concerts are an excellent way for kids to learn the music of their parents’ and grandparents’ day. They started practicing. Beth said she found it very interesting how the director stripped the songs down into little pieces to start working on them in different combinations—only sopranos for one bit, altos for another, sopranos and baritones together—rather than having everyone sing together as they would eventually. Also, they didn’t sing the French words on the first day, just the words “one” and “two” in place of them so they didn’t have to struggle with unfamiliar pronunciations and the music at the same time. He did give them some pointers on diction for the English songs, though. The last thing that happened, back in the auditorium once the choir campers were reunited with the orchestra campers, was a raffle. They have these every day at all the music camps. The prizes range from t-shirts from previous years to Six Flags tickets. One tradition is to raffle off a cardboard box every day. This stands for the right to sit in the box seats of the auditorium during the next day’s post-lunch concert. When I picked June up from camp on Monday she seemed cheerful. She’d painted in her art elective and played theater games in her drama elective. There had been an all-female barbershop quartet at the post-lunch concert. She was wearing her t-shirt from orchestra camp last year because it was summer youth music camps alumni day. (All the days had themes. One day they wore funny hats and glasses; another day they were supposed to dress in the colors of the Maryland flag.) Best of all, the chorus teacher had singled her out while the sopranos were practicing, saying people should sing the piece as she was, “lightly” and he also praised her pitch. This was a relief because June had worried a little before camp started if she really had enough experience because a year of school chorus is required to register for this camp and she didn’t precisely have a year of school chorus experience. She was in chorus in fourth grade until it disbanded without explanation right after the Holiday Sing in December. But I thought a third of a school year of chorus, plus several months of private voice lessons in fifth grade, plus musical drama camp every summer since she was five had to be the equivalent of at least a year of chorus so I’d checked the box that said one year on the online form. Friday I made my way to the University of Maryland on two buses through torrential downpours. I’d been worried if I got drenched I’d be chilly in the air-conditioned concert hall, so I wore a long raincoat and rain boots and carried and umbrella, and I managed to arrive fairly dry, also forty-five minutes before the doors were supposed to open, but when I’m taking public transportation, I like to be on the safe side. I’d been arriving thirty to forty minutes early all week and enjoying the down-time to read a novel or the newspaper or to keep listening to the podcasts I listened to on the bus. This was the first time all week I wasn’t the first one in the music building’s cavernous lobby. At least a dozen people were already waiting when I got there and settled in with the Washington Post’s Health and Science section. When the doors opened, I got a seat near the front in a place I thought would be good for taking pictures. And it would have been if they hadn’t rolled out a grand piano right into our sightline in between the orchestra and choir concerts, or if June hadn’t been seated because of the crutches. But I’m getting ahead of myself. The orchestra was divided into two groups, one for students entering fifth to seventh grade and one for those entering eighth to tenth grade. I spied two of June’s friends, both cellists, on stage in the younger group. One was from her Girl Scout troop and the other attended her elementary school one year ahead of her and played in the string ensemble with her when they were in fourth and fifth grade. I think it might have been seeing Ingrid, who’d played with June when she was in a well-run school orchestra, and the fact that two-thirds of the kids on stage had just finished fourth or fifth grade that made me angry all over again about how unambitious the instrumental music program at her elementary school was last year, but I pushed that thought from my mind. Anyway, the word “unambitious” cannot be applied to any summer music camp at UMCP. The performances are always very impressive and they would be even if the kids had more than six days to practice the music. The younger orchestra group had five pieces. In a medley of Japanese folk music, one of the melodies struck me as very familiar. Later Beth said it was “Sakura, Sakura,” which we’ve heard at more than one concert. June played it in orchestra in fourth grade and it was a favorite of hers. The last song, “Red Pepper,” was a lively tune fitting of that name. The older orchestra played four pieces. The first two were pretty— “Strip the Willow” had a folksy fiddle sound—but it was the last two “Lullaby to the Moon,” and “Sansaneon,” that really impressed me. I’m not a musician so I often feel I don’t have the language to adequately describe the music at all these concerts I go to because of my very musical kids. I’ll just say the complexity and precision and beauty of it was uplifting. The choir was on next. They started with the French song, this time with the actual words. It seemed to have come together quite nicely since we heard their first practice on Sunday. All the songs had. When they started “Bring a Little Water, Sylvie” June and five other sopranos and altos stepped in front of the choir and finally we could see her. We could hear her, too. I wasn’t expecting to be able to pick her voice out, but I could, and that was exciting. I think “In My Life” sounded the most different in its choral arrangement, even more so than “Bring a Little Water, Sylvie.” (I’m fond of the Leadbelly version of that song.) On the car ride home June asked Beth which one she liked better, the Beatles’ or choir camp’ and Beth had to say the Beatles, even though the choir camp version was good. “But I didn’t sing in that one,” June commented. The last of the choir’s five songs was “We Know the Way,” from Moana. This was the one with the most instrumentation. Most of the songs had accompaniment—flutes most predominantly in the old French song and the grand piano for “In My Life,” but this song started with people blowing conch shells from the balconies and a strong drumbeat. It seemed fitting as the final song of the concert because it’s about mastery. (It’s from the part of the movie when Moana discovers the disused boats, learns her people used to be sea voyagers, and determines they will be again.) 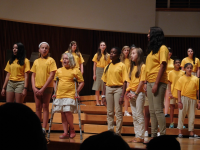 Mastery is a lot of what music camp is about. Getting large groups of talented kids to work together play or sing complicated music and get it up to concert quality in a very short period of time. I’ve been to a lot of these concerts—Noah was in band camp for four years and June’s been to orchestra camp one year and choir camp one year. Still, this aspect of it never fails to impress me. It was a lovely concert and a wonderful way to end a week of political ups and down which included the confusing and upsetting announcement about transgender troops, discouraging words from the Justice Department about its current thinking on employment discrimination against gay and lesbians, the President’s appalling comments in front of crowds of Boy Scouts and police, the alarming debut of the new White House communications director, the resignation of Reince Priebus, and the President’s continued sadistic treatment of his own Attorney General, and finally, mercifully, the defeat of the Republicans’ latest attempt to repeal the Affordable Care Act. Am I forgetting anything? I probably am. Consequently, it was a busy week for Beth at work. On Wednesday, she messaged me that she’d be late getting home, “because I am at this rally saving health care.” And it worked! My point is not exactly that the kids in the summer youth music camps at UMCP spent their week more profitably than the President and his administration, although they did. And it’s not that this experience of working together to make something beautiful will help them work effectively with others in the future, although it may. My point is more modest, just that cooperation to make something worthwhile is still possible, in the arts and even in politics. And it always will be, if we can find the way. 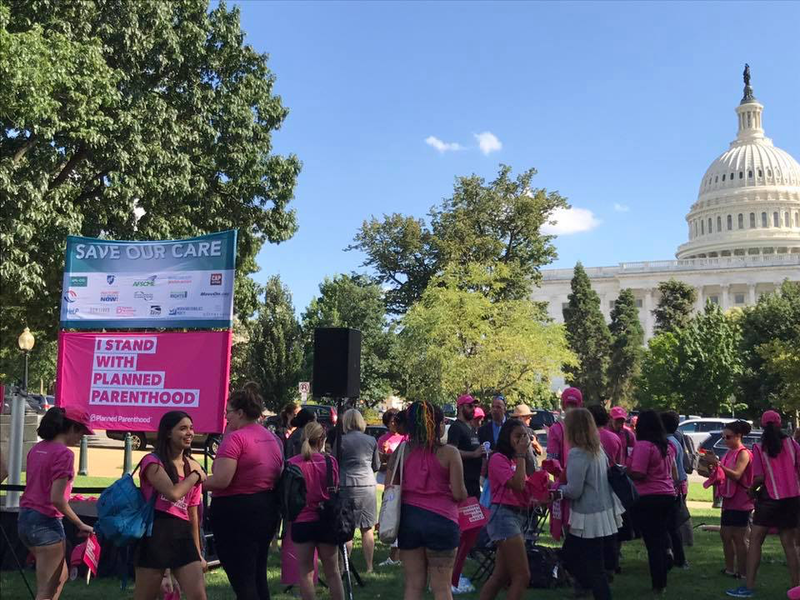 Thanks to Beth and everyone else who rallied, and wrote and called their Senators, and worked behind the scenes to preserve Americans’ access to health care this week. This entry was posted in Extracurricular Activities, Resistance by Steph. Bookmark the permalink.